Remember last week when I said that I was going to get creative with my lunch? I have been having such a great time trying out all kinds of new things to pack in my lunch. 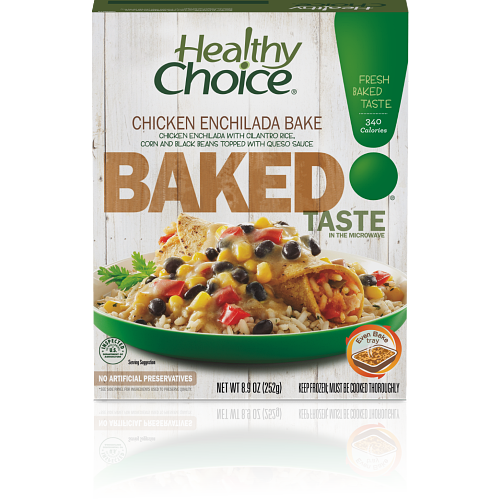 One of my favorites have been the Healthy Choice Baked Entrees. I love them for lots of reasons, but mostly because they are crazy delicious and come in so many great recipes! My all time favorite is the Chicken Enchilada Bake. This dish is a full-flavored chicken enchilada over cilantro rice and topped with corn, black beans and a queso sauce. When you peel the film off the top after cooking it the smell of cilantro just hits you in the face! It’s so fragrant and fresh. No way does it taste like a freezer meal to me. You can really tell that Healthy Choice Baked Entrees combine wholesome, quality ingredients to each of their dishes. This results in fresh, baked-from-the-oven taste straight from the microwave. There 10 great recipes to choose from. My goal is to try them all! My second favorite is the Italian Sausage Pasta Bake. It combines fresh made whole grain rotini pasta paired with juicy Italian sausage, tossed in a rich garlic marinara with bubbling mozzarella cheese. It is awesome! I swear I want to lick the bowl after finishing it (and maybe I did…). This doesn’t feel at all like you are eating healthy. It’s so rich and satisfying. If this is what eating healthy tastes like, I’m hooked! I have really enjoyed trying to spice up my brown bag lunch for the last few weeks. I have learned that not only is it a treat to pack a Healthy Choice meal, it’s also very good for me. I don’t have to worry about counting calories or protein. They have done all of the work for me. Disclosure: This post is brought to you by ConAgra Foods. I’ve been compensated for my time; however, as always opinions and thoughts are my own. October 10, 2013. cooking, coupon, health, Review. blog. It appears as if some of the text within your content are running off the screen. October 17, 2013 at 7:03 pm. Permalink. October 17, 2013 at 7:45 pm. Permalink.